Like an old friend who you haven't seen for several years but who you remain entirely comfortable with, Toy Story 3 doesn't waste time on introductions or meaningless pleasantries. Instead, it sits you down, offers to pay for your first drink and resumes the conversation you started eleven years ago. The immediacy with which the film expects you to fall back in love with Woody (Tom Hanks), Buzz (Tim Allen) and the rest of the characters is endearing rather than arrogant and the fact that we're thrown back into their lives with so little wasted exposition and re-explaining of all that went before speaks volumes of the grip Pixar people like John Lasseter (writer) and Lee Unkrich (director) have over their creations. There's a story for them to tell here - this isn't a meaningless sequel just to round off the trilogy - and their tightness of design and accuracy of execution beat most live-action offerings hands down. The Pixar collective's understanding of their audience has always been remarkable. With Wall.E (still their best film) they understood the power of a dialogue-less narrative and recognised that an intelligent audience didn't need everything explaining to understand and enjoy. With Toy Story 3, Lasseter et al understand that their audience has grown up with these characters and is likely witnessing their final hurrah. And boy, do they leverage this. No moment is wasted to pull the heart strings or reference how the changing of age can effect viewpoints and understanding. It's clever and self-referential but it can also be layered a bit thick and only a handful those moments truly leave you reaching for a tissue. 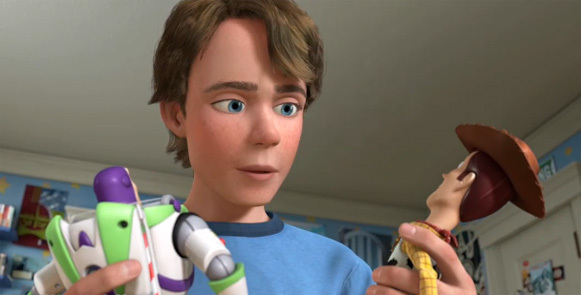 Regardless of their attempts to make you teary, Pixar know you want a good story as well and the narrative, which focuses on what will happen to the toys when Andy goes to college, provides plenty of opportunity for the simple escape-plan pleasures that have been so enjoyable in both previous entries. There's no real divergence from the simple structure of putting a toy (or toys) somewhere where they don't want to be and watching the rest of the toys try to break them out but there doesn't need to be: the characters are so beautifully realised that every moment -from Woody's recognisably flailing run to new character Lotso (Ned Beatty) leaning on his walking stick - is a joy to watch, regardless of whether we've kind of seen it before or not. At over one-hundred minutes, the film is perhaps a bit longer than it needs to be but it still rattles by at a pace perfectly judged and set by Unkrich in the first reel. In comparative terms, Toy Story 3 is just above its predecessor and just below the first entry. As a collective, they're about as close to a perfect trilogy as you're ever likely to see. Loved it (like everyone else). One of the best movie of 2010 and deserving of an Oscar nod for Best Picture. And I'm sure it will get it. Very interesting to hear the reports that its awards campaign is focusing on Best Picture, not animated.